If I had just known what I know today ……….. Educated at the Copenhagen Business School, Denmark I ventured in my late twenties to Australia to further my knowledge of business abroad but also to pursue my interest for design and development. In 1999 while expecting our daughter my husband and I bought a semi-detached house on the Lower North Shore which we eventually would fully renovate while living in Singapore as expats. However, I had no idea of all the underlying issues that later would unfold from this supposedly chosen sanctuary spot, issues that I would never have dreamed of existed. By sharing my story I hope that you will look through your own environment and make sure that you are SAFE. Below is a summary (excerpt of my log book) of the symptoms I experienced, how they started, as well as of the many and varied EMR sources I was exposed to and how layer by layer it unfolded. The summary also depicts the responses by the various authorities when approached on this matter. In January 2006 following a period of light headedness, headaches and occasionally vomiting I suddenly had a severe arrhythmia attack which prompted an emergency visit to the doctor. The doctor did a trace showing atrial fibrillation with an average heart rate of 140 beats per minute. Follow up tests were performed by a cardiologist with no unusual findings and all tests normal. During the whole year of 2006 I often felt lightheaded, would get headaches and had the occasional vomiting. 2008 – Back in Australia – our house newly renovated with new wiring everywhere except the 3 bedrooms – have occasional headache, dizziness and vomiting. 2009 – Have occasional headache, dizziness and vomiting. 2010 – Feeling unwell, upper back (spine) and neck hurting – I see my chiropractor – no relief. Occasional vomiting, headaches and dizziness. I started recording my health issues due to an unusual high amount of vomiting and headaches (every second hour in between sleep I would vomit and it usually would last a whole day) – symptoms I had never suffered from in my whole life. My records were given to doctors and other health professionals who treated me in order to give them a coherent picture of my health and the frequency of these symptoms from which I had then hoped for some kind of correlation/diagnosis to emerge. 07-06-2011 On recommendation from Ayurvedic practioner have a scan to see if anything unusual – get an referral for the scan at my GP – everything normal - also again speak to her re problems of why my back and heart section front are hurting – Her diagnosis same as before – could be a pinched nerve in the thoracic spine which can be so painful and cause the vomiting (I’m not so sure, does not feel like that). Have acupuncture till December 2011 no vomiting. Feel this pressure at my back and around my heart. It is hurting so badly. 10-05-2012 Appointment with new GP – to have an age related Health Check Up and to discuss the vomiting. 21-05-2012 Insure Pathology Results for bowel cancer – negative. 21-05-2012 Mater Hospital for Mammogram, Ultrasound, and Bone density ….. results OK – (have had two cysts in left hand side of breast – worried that could be the pressure – but all fine) – still has this pressure on my heart like it is expanding and the last 3 nights I have woken up at 1 pm - feeling tightness, dizzy and with jaw ache. 23-05-12 Call the new GP’s office (GP on holiday) – other GP checks my results - say they are fine but if not feeling well go to Royal North Shore Emergency – I call the cardiologist who examined me in 2006 – he has no appointments till June – his assistant tells me to go to Royal North Shore Emergency. 29-05-2012 Finishes SALPRAZ and is prescribed PANTOPRAZOLE …..can take if helps but as it seems to make no difference I stop. 01-06-2012 Stress test at Royal North Shore – they find high blood pressure when exercising on (electric) walking machine. 13-06-2012 Holter Meter checks heart beat for 24 hrs – have to record every 15 mins in the day. cardiologist and explain that I’m fine when going to bed but on wake up feeling unwell – something has been happening during the night – we discuss sleep apnea. 13-11-2012 So sick vomiting all day. 15-12-2012 Stops acupuncture (seen nearly once a week since June) as too busy up to Christmas. 01-03-2013 Acupuncture – after treatment felt better. 16-03-2013 Vomiting after dinner out. 06-05-2013 Re-appointment with Gastroenterologist – Everything normal - only had Gastric reflux. 13-05-2013 See doctor re sleep investigation – Everything was normal. Just a summary of specialists seen - please refer to the EHS symptoms on this website. 25-09-2013 A field study which happened to be in my house led by my lecturer Nicole Bijlsma, founder of Australian College of Environmental Studies and also a building biologist, revealed high readings of electromagnetic fields in our bedroom – 13 mG on the bed with much higher readings all over the house at various times of the day/night. ​An investigation began in order to find out what caused the high electromagnetic fields and we decided to consult an EMR person – as even when our electricity was off – we had high readings. 13-11-2013 It was revealed that the high electromagnetic fields were being produced by our water pipes made of copper drawing in electricity from the water’s main i.e. although our power was off/low – at times we would get the whole street’s load!!!!!!!!!! The field was successfully reduced to 0.2 mG by cutting the pipe near the water meter and installing a piece of plastic pipe. Although the water meter was unchanged during the renovation in 2007, in an ideal scenario, if this were standard procedure to a common problem, a test performed by the certified plumber and electrician could have eliminated any dangerous levels of Electromagnetic Fields. That most plumbers/electricians are not aware of this issue. It would be great if it became mandatory for all plumbers and electricians to check for high electromagnetic fields/net current and issue a certification to confirm that it has been checked. In general only metal pipes are a problem. 22-12-2013 Stop Acupuncture due to Christmas and holiday break. 05-03-2014 Cell towers at end of the street are upgraded to 4G Wireless with another 5 panels, one of which is pointing straight onto our roof - upgrade finishes 28/03/14. No notice was ever given. 14-03-2014 Woke up 2 am (went to bed at 10.10 pm) with severe pain pin and needles on my back, arms and legs – feels like barbed wire has been dragged through me. 15-03-2014 Starts Acupuncture to get relief ……………………. We decided to get a qualified Building Biologist out to measure the EMF level in/around our home. (Building biologists have got all the right equipment - most of it very expensive). 12-06-2014 Acupuncture – Acupuncturist suggests to see a neurologist as my health does not improve……. 19-06-14 Was recommended by our EMR person to see a homo toxicology practitioner. of PVC pipe instead) – it was reduced to a healthy 0.2 mG.
High energy distortion feel/pulsing is in the house at all times, however most noticeable when we sit still or sleep. Sat 4-07-2014 Write an e-mail to Carrier’s contractor to inform our concern. Since the latest upgrade of the telephone towers at ........................... in March this year, our house has had a high energy distortion feel to it, causing insomnia, tingling in the whole body, headaches, heart palpitation, ringing in the ears and tiredness – We have moved around to all our rooms (in total 6) and can only find some comfort in our sitting room for sleep. In general we only sleep around 3 hours per night and are awakened by a constant pulsing. The same feeling seems to come when we are sitting for a longer period of time. Also a high pitch ringing sound seems always present. I have had a building biologist out to test our home and the readings are indeed high – a hotspot was detected under my desk – the readings were 42926 microwatts/m2 (taken 29/05/2014 @ approx 11.15 am). Please note that this reading was recorded with the power off at the meter box!!! Please refer to the building biologist’s readings which I have attached. In order to double check the findings, we asked an EMR person to come out a week later, he also recorded high readings and was kind to lend us his acoustimeter – Please see below a screen shot of the reading which this time was 55902 microwatts taken 5/06/14 @ approx 9.10 pm in a different location of our house (and until then was a supposedly quiet place of the house). The screen shot is of a video we took as the video is too big to send. We are obviously deeply concerned and wonder how many of these high readings are affecting us day and night. For your information we have had electricians here for three days checking all our wires for EMF and to make sure they are not the cause. We have had a linesman in to check the electricity street pole and wires outside our house, and also our television antenna has been replaced with a new lower one including a filter. We have disconnected our air-conditioning system/heater as the incoming wires on the South wall were close to the first mentioned hotspot (42,926). Unfortunately all this work has made no change to the high readings in our home and our upstairs remain uninhabitable, and the bedrooms impossible to sleep in. Due to the age of the house, shielding will only work by installing a new roof, and that does not even guarantee us “peace” or a normal life … we could be up for carbon paint on all our walls + special film on the windows causing us not to be able to use our mobile phones when inside which seem a bit ridiculous when we are starring at a mobile phone tower. Obviously, readings of these magnitudes are dangerous to our health and require a site check both in our home and on the NSA site. I am also enclosing the latest public Summary of Estimated RF EME Levels provided by ......... dated 13/06/2013 – Does this summary correlate to the latest upgrade? I will attend this site as soon as possible to check the issue. Sun 5-07-14 The high energy distortion feel/pulsing gets worse – cannot sleep. be used on a bigger scale for the house later. Fri 11-07-14 Distraught energy /pulsing – out most of the day. Fri 11-07-14 So bad - left in order to sleep in the car (no alternatives that night). Sat 12-07-14 Out most of the day – feeling pins and needles – 4 hours sleep. Sun 13-07-14 Distraught energy/pulsing – out most of the day – bad night with not much sleep. 10.30 am please see picture of high reading of 4908 uW/m2 at the sofa table below (this is a screenshot of the video) where we previously had recorded low readings. That would explain why sleeping here is now not possible anymore – Also sitting at our dining room table has become an issue – it’s like the “beams” have been directed now also towards the northeast i.e. our sitting room. This is upstairs on our roof terrace reading is 10,450 uW/m2 - the sitting room is directly below. ​Referring to ARPANSA’s Fact Sheet 14 “How to reduce exposure from mobile phones and other Wireless devices” – ARPANSA are talking about distance, time and power, how to exercise that in the environment around a house like ours? - it is like being involuntarily on a mobile 24/7. @11.00 pm Left house to sleep in the car as could not take the pins and needles and the high pitch sound anymore. @ 9.00 pm Left home to spend the night at a lodge in Neutral Bay to avoid the pulsing radio frequencies and get a decent night’s sleep. supposed to have a trades person to repair an appliance – but could just not be home and had to cancel him – was out all day just to avoid the biting frequencies though had heaps to do at home, and really had nowhere to go with the dog for a whole day. @ 3.10 pm Energy seems a bit better. @ 6.30 pm Energy just as distraught as previous days. @ 7.53 pm Energy still as distraught. @ 9.00 pm Left to spend the night at a lodge in Neutral Bay. @ 10.00 am Decided to spend the day at home as thought that maybe things had improved after Carrier’s contractors had finished their work on the towers, however, it is worse now and the pulsing frequency is biting into the skin, this is now happening in every room of our home and there is “no rest” anywhere. sake have to stay away from ‘that radiation field’ i.e. the cell towers. Sat 19-07-14 We are looking for alternative accommodation – sad really since our home otherwise is where we prefer to be. Sun 20-07-14 Back at the lodge in Neutral Bay. Mon 21-07-14 Home is intolerable – stayed for two hours and had to get out – have booked the lodge at Neutral Bay again tonight. 21-07-14 E-mail is again written to the carrier’s contractors pointing out that we have trouble being in the house due to the emission and that we had hoped for some relief from their “rectification” attempt - that due to the fact that we have got a daughter in high school who needs stability and a dog which we cannot take everywhere this is now becoming a big strain on us emotionally, financially and health wise, and we will have to move out till a solution has been found to this problem. Tue 22-07-14 Home to pack up – temporary accommodation in Waverton + take husband to airport for business trip. Wed 23-07-14 Temporary Accommodation, Waverton – challenging as Wi-Fi is the only source of internet, discover that the landlord’s router is on the other side of our bedroom wall!! – we ask them to move router – daughter has to be at our house alone to do homework. Thu 24-07-14 Temporary Accommodation, Waverton. Sat 26-07-14 Picked husband up from airport and went back home intolerable had to go to a lodge at Cremorne Point for the night. 05-08-14 Back at temporary accommodation, Waverton as this is the only place available now and on a short term rent, takes a dog and is reasonable close to my daughter’s school. Again not ideal – daughter has to go to our home to do homework when internet is required due to only Wi-Fi option at temporary accommodation - have to go there to pick her up. My husband comes home from work, eats at temporary accommodation and then with his late night business skype calls is forced to stay most evenings at our home for then late at night to travel back to temporary accommodation. Being treated by the homotoxicology practioner once a week. Tue 5-08-14 Back in the house – don’t know if anything has changed since our last e-mail of 21/7 to carrier’s contractors – busy unpacking – can still feel “radiation” – so tired – slept in my bed. Wed 6-08-14 Waking up with a headache – 10.00 am vomiting - had to go to Balmoral beach (the closest) to get rid of nausea – so tired – Epsom salt bath - slept in my bed. Thu 7-08-14 I am out most of the day – very sore sternum (growing heart) – Epsom salt bath - slept in my bed. ​Fri 8-08-14 Sore sternum (growing heart) – slept in my bed woke up at 1.30 am feeling the “radiation” - went to the sofa in the sitting room. At homotoxicology doctor diagnosed highly EMR sensitive and recommended not to be at home unless something is drastically changed. 10.58 pm High activity: on sofa table in sitting room, my daughter’s bedroom, (we both cried when we saw the readings on her bed), on our bed and no changes upstairs - still very high. Wed 13-08-14 My daughter is very sick with the flu 41 degrees in fever – I have to stay home – not well at all and we are desperate to find alternative accommodation. @10.45 pm Really really bad streaming could be felt in all rooms downstairs + garden. Fri 15-08-14 My husband is home to look after our sick daughter so I can get out. @ 6.27 pm “Really bad streaming” - we manage to find some accommodation in Balmain and leave home at 9 pm. The accommodation is a separate upstairs facility to a house. Sat 16-08-14 We are all very sick with the flu and in bed all day. (which I do not see) – I lie with her as she is sick and realize that it has a very high electromagnetic field!!!! We disconnect the air- mattress. Mon 18-08-14 Extend our stay at Balmain – my daughter is still sick. me tired – looking for rental property as realise we cannot stay in the house. Wed 20-08-14 My daughter is still sick - I sleep on the sofa – not well – looking for rental property. Thu 21-08-14 Night at a lodge in Neutral Bay as not well at home. Fri 22-08 -14 Cannot be in the house – slept in the car. Sat 23-08-14 Out most of the day – on house inspections – slept in the car. Sun 24-08-14 Not feeling great – booked a room at a lodge at Cremorne Point for the night but car trouble prevents me from going – instead on sofa – so bad that I have to move somewhere else - in bedroom 3 (study) – not good either – not feeling well. Mon 25-08-14 Feeling awful – get an appointment with Acupuncturist (he knows me and have treated me for the last 3 years). My husband and I decide that I cannot sleep in our home anymore and that we must find some rental accommodation for a longer period and until something is sorted. For now at the lodge in Cremorne Point, get a room at the very back which specifically has a very low Wi-Fi emission. rental accommodation on wired internet. Home to be with daughter after school and cook dinner - @ home “streaming” pressure on my body. Off to lodge at Cremorne Point for the night. that the situation is “real” based on the logs, records and screen shots of readings he has seen, which shows a degree of knowledge and research in the subject area. that a solution would be implemented “soon”, and “soon” meant a timeframe of a few weeks! will consider how to resolve the issue. Wed 27-08-14 Home @ 7.00 am to get daughter to school, take dog for a walk. at Cremorne Point for the night. Thu 28-08-14 Home @ 7.00 am to get daughter to school, take dog for a walk. Inspection of house in Greenwich. Home to be with daughter after school and cook dinner - @ home ”streaming” pressure on my body. Off to lodge at Cremorne Point for the night. Fri 29-08-14 Home @ 7.00 am to get daughter to school, So exhausted, as not feeling well we decide to board the dog for a week @ Gordon. Home to be with daughter after school and cook dinner - @ home ”streaming” pressure on my body. Off to lodge at Cremorne Point for the night. Sat 30-08-14 Stayed out of our house the whole day. Off to lodge at Cremorne Point for the night. acupuncturist to get some relief. Home to be with daughter after school and cook dinner - @ home “streaming” pressure on my body. Off to lodge at Cremorne Point for the night – my daughter is with me as she does rowing early in the morning. Tue 2-09-14 Home @ 8 am to 11.30 am to organise move – feeling so unwell. Wed 3-09-14 Home @ 7.00 am to get daughter to school. Home to be with daughter after school and cook dinner - @ home ”streaming” pressure on my body. Off to lodge at Cremorne Point for the night. Thu 4-09-14 Home @ 7.00 am to get daughter to school. Home to be with daughter after school and cook dinner - @ home ”streaming” pressure on my body. Off to lodge at Cremorne Point for the night – my daughter is with me as she does rowing early in the morning. It takes the carrier nearly two weeks to connect the phone line so we can have wired internet to this property i.e. my husband and daughter are still in our home when they have to be on line. Internet is connected on 17/9-14 –!! Meanwhile trying to recuperate from the EMR, we are now having to decide whether to sell up or how to best shield our home from telephone towers, as we have not much faith in anything being resolved by the Telephone Carrier, nor that another place if we bought would not be the same – The design of the house determines the feasibility …. With no guarantee we decide to shield, we love our house and the position – it takes the entire stay at Greenwich to organise tradespeople and material which is coming from www.yshield.com Germany. My husband spends all his spare time back at the house testing various types of mesh – to measure the attenuation and potential bouncing of the radio frequencies. We are also liaising with Carrier. Thu 9-09-14 Carrier arranges for NATA measurements in our home with a report to follow. “Specialist” coming from Perth – Measurements are taken with a short fixed interval and he is finished within the hour. He tells us that he is in high demand and can argue any numbers. @ 4.42 pm that the Carrier is within the law. “When 3rd party RF measuring firms submit a report that says a cell tower facility or school environment is FCC compliant because it is only 1/10,000th of the FCC limit, it is true, sounds good and gives the layperson a sense of safety, but he does not realize that this value that is 1/10,000 of the FCC limit is already 1000 times higher than areas far away from a cell tower or router, and that this is a chronic exposure 24/7, 6 hrs/day, 5 days/week, 40 weeks/year for anyone living, working or going to school near cell towers” (8). 24-09-14 Following the e-mail including the NATA report my husband has a telephone meeting with the Carrier’s spokeswoman LH. Notes of the call that I had with LK from Carrier 24-Sep-2014 at 10:32, the two calls lasted just under 20 mins. LK Initially called my mobile. LK is familiar with EHS, and expressed sympathy with the health situation. I stated that we only have 9 weeks in this property, what happens then? No response, up to us. LK enquired after the measurements taken by PN, NATA accredited measurer. If he had taken readings in the requested locations. I stated that the fact remains that Lisa became sicker and sicker at home and stabilised and showed signs of recovery at the rental property. For clarity I summarised the discussion as “could I assume that at this point in time Carrier has no intention to do anything further in this matter”, this was affirmed by LK. I re-iterated that the best medical advice was to “remove yourself from the emissions source”, how would LK suggest we do that? I requested the opportunity to test the ability to live in the house if the tower was switched off. LK questioned if PK had said with the above (I reconfirmed the discussion). LK stated that this was not an approved measuring device – I responded that we can have the NATA accredited people to measure this if required by Carrier. LK would get back to me on this on 8 Oct.
Our RF-Analyser is used by building biologists, and a more affordable version though likely less accurate of the Nata accredited equipment. ​LK called my husband’s mobile on 8 Oct 2014 at 15:44. Therefore you are not prepared to make any changes to the cell towers at ……. Any further issues we want to raise should be put in writing. As per protocol I started off with the carrier’s subcontractor then the carrier and the next step was to send an e-mail to ACMA (Australian Communication and Media Authorities). Subject: Wireless Base Station RFNSA Site No …………….. - Upgrade March 2014 - Adverse Health Effects & Unable to Live in Our Home - 2 Kindergartens, a School, and a Learning Centre within Same Distance. 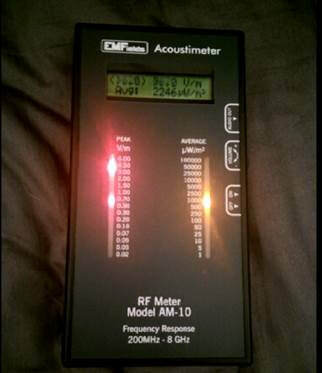 Minimising public exposure to EME – An upgrade in March 2014 has left antennas beaming straight onto our roof causing extremely high readings inside our house (RF meter maxed out @ 57,000 uW/m2 on my working desk, please see video below (For ACMA only), especially one antenna is of great concern – this has resulted in adverse health effects to the extent that we have had to move out of our home - I the undersigned, now severely EHS, (Electromagnetic Hyper Sensitive) am restricted in so many ways of life e.g. cannot stay in any accommodation close to telephone towers or with Wi-Fi or DECT phones, cannot use any computers or phones unless they are hardwired, a setup which we have in our home – cannot be in my own home more than half an hour before I have to go (really hard even when I just have to pay the bills over the internet) – we have been living in a suitcase since July – not ideal when we have a child in High School who requires internet for home work and some sense of stability – (all communication with the school is via internet and is received on a daily basis) - we have spent over $20,000 till date (evidence available on request) on alternative accommodation just to get by/exist, although we prefer our home. Our alternative rental accommodation is expiring on 6th November and we are just about to spend another $20,000 in order to try and shield our house with no guarantee that it will work, although we have spent the last two months investigating options with a German building biologist as well as shielding products from a German based company – if this does not work we will have nowhere to live. Making the house ready for sale let alone trying to pack it all up will require time in the house, time which will make us sick and physically unable. Video of readings at our home: (for privacy reasons not available here, please see own experiences in EMF Sources on this website). I am also including a video of the readings of where we are living at the moment – it should be noted that in this alternative rental accommodation there are no problems with sleeping nor with staying in the house 24/7 and an improvement in my health is evident. Video of readings at rented place: (for privacy reasons not available here - please instead see the below video made on mobile readings on acoustimeter (filmed at the rented place) as it indicates the background emission before turning on the mobile). “Overall, the evidence suggests that the radiofrequency (RF) electromagnetic energy (EME) emissions of mobile phone handsets are not harmful to the user. However, the technology is very new and it’s impossible to be completely sure there isn’t some risk. This is particularly true for children where there is little research evidence”. The readings from the above video of a mobile phone in use seem to correlate with what is happening in our house i.e. involuntarily we are on a mobile 24/7 – ARANSA is talking about distance, time and power, I would appreciate it if you could please elaborate on how we exercise this in our house. According to Professor Olle Johansson, a world-renowned scientist and researcher into electromagnetic radiation (EMF/EMR) and its adverse health effects, “being on a mobile for 24 hours is equivalent to having 1600 chest x-rays “ – who can endure that? According to Hardell et all, 2008: “Children’s skulls are significantly thinner and their brains have higher conductivity which means they will be exposed to far higher levels of radiofrequency radiation than adults” – Our daughter is now 14 – what impact has this had on her??????? Behind us is another learning centre not to mention a High School directly opposite the base station on the other side of the main road. (No videos available here due to respect for privacy). Physical characteristics of the site, such as height and terrain – With the equipment and the recently added in total 5 more antennas, the building does not seem to be tall enough, ……………… and considering the surrounding buildings including our property that have direct line of sight and is almost at the same level as the antennas. Our property is 82 m from the antennas. ​As per C564:2011 December 2011 page 36 – “There is a need to balance the requirement for the telecommunications industry to provide adequate service with the need of the community to be ensured of living in an environment that will not be a potential threat to health”. I started recording my health issues due to an unusual high amount of vomiting and headaches (my records have been given to health professionals who have been treating me in order to give them a coherent picture of my health and the frequency of these symptoms) – it has turned out to be a very long list that dates back to 2006 (available on request). Ultrasound of Abdomen + CT scan for main artery. As per C564:2011 December 2011 page 30 10.1 Requirement for Carriers to keep informed about EMR Research. 10.1.1 Carriers should keep informed via relevant scientific bodies of the significance of the results of scientific investigations of studies on EMR. ​Please find attached an EME Survey Report (NATA report) commissioned by Carrier on our house. (not available here due to copyright by NATA). The report surely show some high readings especially on our first floor. With only a 1 minute sample of actual value reading the NATA report does not give a very good indication of how high the exposure level is in our house on a 24/7 basis nor how it is to live here 24/7, hence the videos above to give a clearer picture of what is happening – please note that these videos were taken on different times and on different days, and clearly indicates that 5-6 pm is not necessarily the busiest period of transmission for the cell phone towers. (This also confirmed by PK who conducted the readings and wrote the EME Report). Also we do not know how many of these high readings are transmitted in a 24/7 setup and how frequently they occur and in which rooms, and more importantly how and when to avoid them when they strike. Thank you for your correspondence in relation to the Wireless Base Station (RFNSA Site No ……… located at ………………… NSW. The ACMA has been tasked with ensuring that devices offered for supply and/or operated under licences in Australia meet the requirements and limits set out in the Radiation Protection Standard for Maximum Exposure Levels to Radiofrequency Fields – 3 kHz to 300 GHz (2002) (the ARPANSA standard). The Radiocommunications (Electromagnetic Radiation – Human Exposure) Standard 2014 (the Human Exposure Standard) adopts the exposure limits in the ARPANSA Standard and together with other legislation sets compliance obligations for suppliers of end-user equipment (e.g. mobile phones, WiFi equipment). The Radiocommunications Licence Conditions (Apparatus Licence) Determination 2003 (the Apparatus LCD) imposes the exposure limits in the ARPANSA Standard on operators of apparatus and spectrum licensed transmitters (e.g. mobile base stations, amateur stations, broadcast television and radio sites). The ACMA's role in relation to electromagnetic energy (EME) focuses solely on the operation and performance of radiocommunications transmitters. The ACMA’s regulatory instruments reference the ARPANSA EME exposure limits for fixed installations and end-user devices. In relation to your concerns, the ACMA will conduct a compliance audit on the site. ​I will correspond further once this audit has been concluded. I refer to my email dated 24 October 2014. As previously advised, the ACMA's role in relation to electromagnetic energy (EME) focuses solely on the operation and performance of radiocommunications transmitters. The ACMA’s regulatory instruments reference the ARPANSA EME exposure limits for fixed installations and end-user devices. The ACMA has now concluded its compliance audit on the Wireless Base Station RFNSA Site No. ……… (suburb name), and I can advise that the site is compliant in that it meets the requirements and limits set out in the Radiation Protection Standard for Maximum Exposure Levels to Radiofrequency Fields – 3 kHz to 300 GHz (2002) (the ARPANSA standard). I can further confirm that both Carrier A and Carrier B Australia have met their compliance obligations with regard to the ....... site. The ACMA is not an expert body on the possible health effects of human exposure to EME and accordingly is not responsible for investigating any such health effects. The relationship between health concerns and exposure to EME, including EME hypersensitivity’, is properly the domain of health professionals. I acknowledge your concern that you are particularly sensitive to the effects of EME and experience a range of symptoms in the presence of EME. I wish you well in your efforts to resolve your health problems but, as I have outlined above, the ACMA's responsibility in relation to EME extends only to the operation and performance of radio communications transmitters and not to the investigation of any health effects associated with exposure to EME. tradespeople on site with no guarantee that the shielding will work. While in “exile” and keen to save our renovated beloved home as well as ourselves, we spent every spare moment of the two months away investigating shielding options with a German/Australian Government accredited trained building biologist, as well as shielding products from a German based company. ​Mesh with an attenuation of 25 dB / 99 ½ % reduction was installed on the entire south wall facing the telephone towers but also to eliminate our neighbour’s strong Wi-Fi only 1 meter from our bedroom wall which is - 40 dB (red). Mesh with an attenuation of 25 dB / 99 ½ % reduction was installed on the entire west and north facing walls in the first bedroom to eliminate bouncing radio frequencies as the antenna pointing in our direction is very strong on our front verandah and bedroom window, often the readings would exceed 1000 uW/m2. The mesh on the west and north facing walls in the bedroom were later replaced by shielded curtain material to increase the attenuation to 38dB, a necessary step in order to stay in there. All skylights and windows were fitted with Mesh with an attenuation of 25 dB / 99 ½ % reduction. 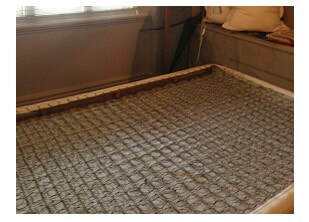 The shielding allowed us to slowly return to our home, although not perfect it was an approx. 90 % reduction, though realizing that bouncing radio frequencies were also a challenge. As a layered onion we had peeled away a substantial amount of the Cell towers’ emission as well as our neighbour’s high Wi-Fi – thus enabling us to believe it or not identify more EMF sources. 10-12-14 Still unraveling events – feel pretty charged and sore – find out that the springs of the base of the bed feel really charged (our mattress has no springs) – we take out all the springs. According to Dr Magda Havas: “Live blood cells become sticky and clump together (rouleaux formation) when I use a computer or a mobile phone. This type of analysis may be useful for diagnosing people with electrohypersensitivity” (30). ​Dec - 2014 It is summer time - spend a lot of time outside away from any cell towers and mobiles - cannot go to the beach when it is crowded as most people are on mobiles even at the beach. Jan- 2015 Swimming a lot, walk in sand, still not feeling so good. 03-01-2015 Feel not well at the dining room table – happens in the morning and in the evening. 21-01-2015 Something electric is bothering me – we ask the electrician to move wires away from the center of the floors as well as lowering the wires under the sub-floor as much as possible. Plumber checks gas pipe for Electromagnetic Fields. Linesman changes our incoming electric wires to a different phase at the street pole in order to separate us from neighbors’ dirty electricity, if any. ​01-02-2015 Our security door made of iron seems magnetized. our ceilings are 3 m high … we are puzzled. 08-02-2015 Low frequency noise next to my side of the bed on floor (power point) – very bad night. Have some good and bad nights. 21-02-2015 A whole day @ a venue to learn another subject for my accredited course at ACES – all fellow students know my condition and are kind to switch off their mobiles – have to move as also sitting directly under a coiled energy saving globe – first time realizing that the globe was a problem - not feeling well the rest of the night. 25-04-2015 Equipment noise from nearby Campus makes loud noises arising from faulty air-conditioning units to exhaust fans all night every night. feel spacey, pins and needles on skin. ​07-08-2015 Not a good night – went to bed at 10 pm up at 12.15 am, 1 am, 3.30 am pain in head try various rooms no success – measure around my bed head 30 uW/m2 coming from the ceiling north wall adjacent to our neighbour. 19-08-2015 Woke up with lots of noise – it feels like “streaming” (like very fine metal pieces are coming through the bedroom window and the @ 3.00 am shielding) – I go outside to check – outside is even worse – feels like something to do with the electricity grid. A big truck is outside the cell towers in the street – we learn that some antennas are not working. vibrations in our street. It is so bad that I have to go out some of the days. Noise and vibration is an issue. Woke up at 1.15 feel this “streaming” again – go to various rooms but all the same – feel pain in all my body – we are in despair and call AUSGRID Emergency …. ​ as 2 “carriers” had problems”- nothing new installed. Above is only excerpts of what was happening – bad nights happened more or less ​every night - I got sicker and sicker sleeping in the bedroom and really anywhere in the house – the high radio frequency in our house was addressed by shielding last year (we thought) – but I felt that there still was “something”. Over the course of the last two years we had our electrician out 9 times just to check/move wires, we changed phases twice and have now been on all phases in the street = 3 – we also had AUSGRID emergency out twice – all saying nothing was wrong while only looking at the switchboard. My skills in measuring and what to look out for had increased, so had my sensitivity and I no longer felt that the two boutique hotels I had used last year were safe – in one of the rooms I measured 300 uW/m2 (realized that this hotel was also very close to a cell phone tower) and everywhere else I could go had Wi-Fi installations (i.e. friends’ places – they all have children using internet for school) which I was also sensitive to so the only way I could get peace was to stay in the car. Again from my study I had learned about “dirty electricity” so we decided to borrow a De-Tekta – a dirty electricity meter. The power point next to my bed was like a loud speaker for the radio station when we plugged in the dirty electricity meter - was that why I had trouble sleeping???? Referring to telephone conversation with James earlier today I am hereby as suggested by James e-mailing you the issues we have with our electricity. I would appreciate it if you could please treat this with some urgency as the situation as it is, is unsustainable. Not able to sleep in the house – feel spikes/transients – often awake between 2-4 am (if in bed before 11 pm – also wake up at that time due to pain – like a jagged sword at my head). We have had numerous electricians out – our house was renovated in 2007 with all new wiring – it has been checked numerous times and nothing found to be wrong with our wiring. We have had AUSGRID emergency out twice confirming the same i.e. nothing wrong in our switchboard (the only place they looked). We have changed the phase to the house twice – so we have now been on all 3 phases (we are on a single phase). Borrowed a Dirty Electricity meter i.e. DeTekta and have especially @ 9.00 pm measured 800 – 1200 millivolt from our power points. In most of our power points we can hear 2GB very clearly as demonstrated in the video below: This video was taken on Australia Day 26/01/2016 @ 2-3 pm. (For privacy reasons video only for AUSGRID). The filters are just a try and are not a satisfactory fix – in some areas it still gets up to 900 millivolts with filters on. All metal furniture close to the power points magnetizes – we have had to take coils out of our bed, drawers with metal inserts in a cupboard also in our bedroom, and we have had to change a stainless study table to a wooden table. Our stainless steel floor lamps which are on separate power points on either side of the sofa are also very magnetized. All the kitchen drawers are also magnetized. We have flickering lights – happened last night at 11 pm. A transformer to one of our halogen down lights in the hallway (in direct line to the Point of Attachment) burnt out without a reason – well, the electrician reckons that the voltage was too high. It was changed by a licensed electrician 2 weeks ago – the same down light blew and was changed yesterday – today again there is not light. Still cannot sleep in our bedroom as the point of attachment is situated close to the bed head and transients are coming in to this point before going to the switchboard. We now turn off all power except for the fridge @ night in order to be able to sleep in the house. Only learned two days ago that our neighbour down the street in ……………. has fans turning on randomly, lights burning out, and that their gate motor blew. Which substation do we belong to? How many houses in the street are on off peak which transmit via us – we ourselves are not on off peak! Could a monitor be set up to measure the transients and the voltage coming into our house – as it is happening throughout the day but worse in the evening and night? Could a filter be installed to reduce the issue? The voltage at your premises exceeds statutory limits. I shall arrange to have this corrected. Our technician also noticed the connection to your service wire has deteriorated. I shall arrange to have this corrected as well. changed and now is within the limits, also a new point of attachment and service wires are installed. ​ radiofrequencies seem only high at the ceiling lamps I did not think more of it ………………..
03-05-2016 Still have problems with “streaming”, something very electric especially at night, lucky if I get 2-4 hours sleep – alternating between my daughter’s room and sitting room now with shielded fabric around me. height it is 170 uW/m2!!!!!!!!! Wonder why my head was hurting – my husband checks with our neighbour – he had just bought a cheap cordless DECT phone for $60.00 to replace the old a week ago - at the base station it was emitting 20,000 uW/m2 i.e. every single room of our house, and it is a big problem in our bedroom. We offer to buy our neighbour an Eco DECT phone to replace this high powered cheap one – at least to reduce the emission - it replaced 3 of the phones which are now only emitting when talking … the 2 other DECT phones remained in place due to coded numbers – unfortunate for us as they were the ones emitting into our bedroom as well as my daughter’s room. Fortunately, when selfsame neighbour wanted internet – he kindly mentioned it to us beforehand resulting in us offering him to pay to have his house wired for internet service instead just to avoid the emission of Wi-Fi. At lunch time sitting at the dining room table working on my computer (only place I feel I can sit) but as so many other times I do not feel well – I hear my neighbour start the microwave and decide to take a reading: it is 200 uW/m2!!!! – I do not use microwaves and I did not expect that a microwave could have so much impact - I’m so sensitive - I can max take 10 uW/m2!!!!!!!!!!! ​10-05-16 Wake up … not feeling great. @ 1.20 am Repair work has been carried out as the next morning “Carrier’s contractors’ “sideloader” was parked in the street next to the cell tower building by 10.00 am it was gone. 19-05-16 Still have problems with streaming, something electric I find a freestanding Airbnb cottage with no Wi-Fi, no DECT phones, no cell phone towers, no mobile phones – I finally get a decent night’s sleep and book for the next night too. 23-05-16 I book the same place for another 5 nights - and feel some relief. Meanwhile at home we test if the radio broadcasting is still on the wires and find that it is still a problem – and we have also still dirty electricity of over 1000 millivolts. @ 8.40 pm Have had bad nights since Thursday – “Carrier’s” contractor's work van is parked in the parking slot – half of road blocked with workers + “cherry picker” at the building of the telephone towers – my husband happened to pass and asked the workers what they were doing – the answer was that they were trying to repair a faulty antenna, however, they did not know which one. Dirty electricity/transients is a problem. Radio broadcast in the switchboard being transferred to our wires is a problem. The switchboard is located in the front part of the house and connected to the incoming wire from the point of attachment (which was replaced by AUSGRID on 28/04/2016) - the switchboard contains 2 double power points - With all power off to the house, using only the power point inlet in the switchboard, the reading of dirty electricity is 1085 m/V with clear audible radio broadcast – good readings should be below 100 m/V. When AUSGRID was asked to recommend a solution/filter for the transients/dirty electricity, they said that “they usually would recommend line filters but since the supply is back within limits they will not have much effect”. According to AUSGRID the dirty electricity appears to be radio frequency and is outside their authority – they recommended to submit an inquiry to ACMA. Our neutral and active line should not contain GSM pulsed signals, and it is imperative that this being measured by ACMA and the source identified. 7. Our switchboard is also facing the cell towers of Site No ……….. which in the street has a constant output of approx. 9-12,000 uW/m2. “As you can see from the above, we have already undertaken a lot of proactive measures and spent a large amount to protect ourselves and our home from the environment, however, it is necessary to identify the true course of the problem in order to effectively implement the solutions and I hope that ACMA will assist us in the same way as AUSGRID did”. As previously advised, the ACMA is not an expert body on the possible health effects of human exposure to EME and accordingly is not responsible for investigating any such health effects. The relationship between health concerns and exposure to EME, including EME hypersensitivity’, is properly the domain of health professionals. The information provided in your latest email of 25 July 2016 (below) has previously been considered by the ACMA, and I can add nothing further to the responses provided in my previous emails to you, dated 11 December 2014 and most recently, 8 July 2016.
living in an apartment, adjoining house or medium density houses where everyone around me use Wi-Fi, DECT and mobile phones. using a mobile phone/ let alone access some of Medicare’s refund as they are only on mobile apps. being in hospital – it has huge implications as regard to conventional treatment in so many fields – that even just breaking an arm becomes a problem. The symptoms could worsen with further high doses of exposure to radiation to the extent that one could become unable to live where there is electricity….. please refer to EMF Refugees under Symptoms/EHS on this website. ACMA’s reply as well as the exposure to the neighbor's high emission DECT cordless phone and Microwave made me realize that we would never be in control of the emission in/around our house. In order TO GET WELL I KNEW THAT I HAD TO AVOID "TOTAL" EXPOSURE to any EMF radiation, especially in my home environment. With heavy hearts we had to let our house go. Undoubtedly, the same issues would be present when buying another house and with that and my health status in mind we decided that it was too risky at this stage. First and foremost it had to be far away from cell towers, smart meters and transformers, secondly, it had to be a freestanding house with very low emission of electromagnetic fields, electric fields,radio frequencies and a good distance from neighbours etc. We were so very lucky to find a “low emission house” we could rent and went from an environment with approx.10,000 uW/m2 outside our home to 0.5 uW/m2 just 2 kms away. Within minutes of being in the house I did not feel well, especially in the sitting room where the router had been placed. We did not know the neighbours, despite doing our checks, could it be from them? We were in an empty house what could it be? With my HF38B EMF Analyser I decided to double check the router and horridly found that it was emitting very high RF… my husband re-checked the router, the Wi-Fi definitely showed that it was turned off …. and again I was sick for a couple of days. It turned out that the router showed that the Wi-Fi was off but the Wi-Fi’s radio transmitter had not switched off … Telstra was not aware of this issue and we therefore asked for a replacement. A replacement, the same model as before i.e. the Gateway Max, exhibited the exact same issue. Luckily Telstra had a previous model which they then sent out - and that worked. In the evening when the lights were on, I started to feel weary, I could literally feel the pins and needles coming back… after further investigation it turned out that the house was fitted with a substantial amount of coiled energy-efficient light bulbs which created dirty electricity – changing the bulbs to the Philips EcoClassic Halogen 240v 2000 hrs) made a huge difference. in order to stay on the healing track. I decided to follow Lee Holmes’s detoxification program from her book called: “Leaky Gut”. My health is slowly returning and I am hoping to be well enough to pay the dentist a visit – next step is to get all the amalgam fillings out of my teeth (in total 8). The amalgam while exposed to the high doses of radiofrequencies has leaked toxin into my body but also expanded and cracked my teeth. forms of mercury exposure to the human body” . The long term effect of the accumulative high doses and exposures I have endured are unknown – It is my hope and belief that the body has a capacity to heal itself as long as it is in the right environment. Nicole Bijlsma, founder of ACES and my teacher who on a field trip at my house alerted the first EMF issue. Nicole offers a fantastic and relevant study program and has through her own experience a very good insight into EMR as well as how a healthy home should look like. Nicole, I cannot thank you enough for offering this program – your initiatives saved my life. Ray Ford, my acupuncturist, who tried to keep me in homeostasis, who listened to me, and always made space for me when I disparately needed a treatment. Thank you so much Ray. John Lincoln, whose valuable insight into electromagnetic fields and testing of same on water pipes gave us a quick and easy solution to the problem and always was at hand for a question. Thank you John. Steve Marsh, our electrician who during the last 2 years visited us more than 10 times, and always was at hand when we needed him most. Thank you Steve. Birgit Richards, our building biologist who was always approachable no matter what the questions were, who double checked our readings and helped us source the shielding materials in Germany. Thank you Birgit for all your help. To my husband who has tirelessly stood by my side and supported me to do what was best for me in order to escape the EMFs. Thank you for measuring the EMF when I could not, researching shielding material when I could not, talk to authorities when I could not, offer to sleep in the car with me when I was low and last but not least fund the necessary steps we had to take ….. I love you so very much. To my daughter – although just starting High School – you understood how serious this all was – you never complained when we tried to escape for weekends, had to move out, or you had to do things alone because it was hard for me to be there, and you always took precautions for your friends not to use mobiles around me, I’m sorry that I had to limit my involvement with you in so many fields - you took it all in your stride and for that I’m very proud of you – I love you so very much. To my family overseas who stay in close contact despite being unable to travel to visit them – who understand even when it was impossible for me to attend my close relative’s funeral. I love you so very much. To my friends who have shown that they a real friends by staying in touch and encouraging me – and always show respect by turning of their mobiles when near me – love you all.